Beautiful Lake living at it's finest on a quiet cul-de-sac! 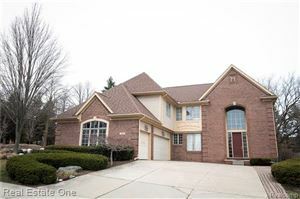 4 Bedroom, 2.1 Bathroom Colonial has 2518 sqft of living space and a finished, walkout basement leading to your own beach area. Views of the Lake from either the deck or the patio below. Kitchen with plenty of working space on the granite counters, appliances included. Floor to ceiling windows in the dining room with waterfront view, Nook with patio doorwall & upper level bedroom with it's own private deck are also added bonuses. Additional features include all new windows, new GFA & C/A (July 2018) large closets in bedrooms, gutter guards, newer HWH, pool table & Paddleboat. 2 car garage. Basement with wet bar & recreation area great for entertaining and a separate work area. Utica schools.